​Goals are important because they help to give clarity of the desired result. Successful business women learn to master the art of goal setting and working those goals to achieving success. 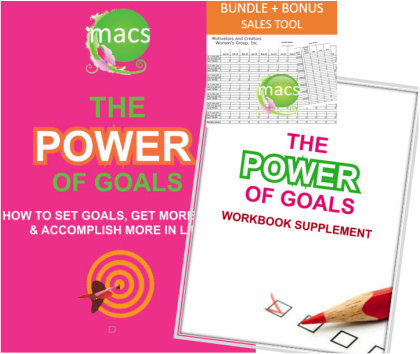 In this Special Power of Goals Bundle, you will be guided through the process of setting your goals; along with the accompanying workbook. Productivity sheets included. As a Special Bonus Offer, we have added a sales forecast tool that will help you map out your projections for a full year. This tool comes complete with an example of how to create a 100K year!